Andi Andrew visited the Nashville Mercy home this week to spend two days encouraging and challenging residents and staff. Andi and her husband Paul are the Lead Pastors of Liberty Church in New York City. During the two morning class sessions she spent in the home, Andi’s vulnerable and honest teaching deeply impacted those in attendance. 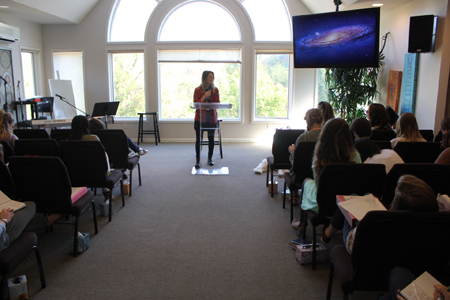 On the first morning, Andi shared the importance of understanding the process of spiritual growth. She stated, “From small things, big things grow,” and then used an illustration of a seed planted and growing underground to further her point. She challenged the group to find a passion for the process of growth, contending that we often want the end result without walking through the process. Within the context of her teaching, Andi shared her personal testimony of the process of forgiveness. She suggested that forgiveness is an act of the will and a continual process. On her second morning with staff and residents, Andi taught on fear and love. She stated, “Fear tells you that you have to perform for love,” while God’s perfect love casts out all fear. Sharing from John 1, Andi explained that Jesus Christ is the embodiment of love and enables us to separate ourselves from fear and condemnation. She shared several other scriptural passages, personal stories, and challenging key points . Following each session Andi entertained questions and responses from the Mercy Nashville residents. 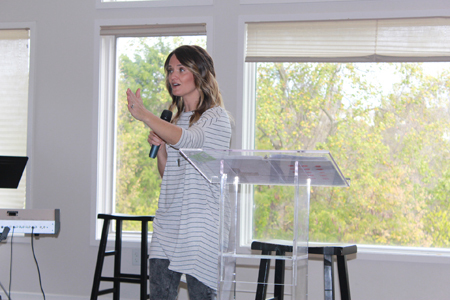 Mercy is grateful for the opportunity to host and partner with Andi Andrew. For more information on how you or your organization can partner with Mercy, click here. 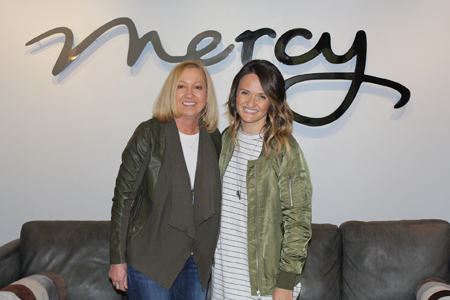 Mercy Founder and President, Nancy Alcorn, and Andi Andrew from Liberty Church in NYC.